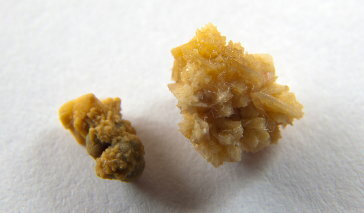 Kidney stones (or nephrolithiasis) form in the urine from mineral and salt crystals that stick together to make pebble-like deposits. These stones, also called calculi, can be as small as a grain of sand or as large as a golf ball. While some stones can be eliminated from the body on their own through urine, larger ones may require medical treatment. Kidney stone treatments can include therapies that break them into smaller pieces or surgically remove them. More than five percent of Americans have had kidney stones, with men two times more likely than women to develop them. Researchers aren't sure why men are more prone to the condition but it may be due to the fact that they tend to eat more meat than women, something that results in an excess of stone-forming minerals in urine. And one recent study found vitamin C supplements may also increase a man's risk of kidney stones, since some of the vitamin can end up in the urine as oxalate, a compound found in kidney stones. Kidneys filter the blood to remove various waste products, such as excess minerals and compounds left over after food molecules are broken down. This includes chemicals commonly found in kidney stones, including calcium, uric acid, magnesium ammonium phosphates, and cystine. Waste products collected by the kidneys are eliminated from the body in the urine. But when urine becomes very concentrated (or "supersaturated"), crystals can develop. These crystals can stick together to form kidney stones. Smaller stones (under 4 millimeters in diameter) can usually pass through the urinary tract without problems. Larger stones, however, may become stuck at some point in the ureter, bladder, or urethra. 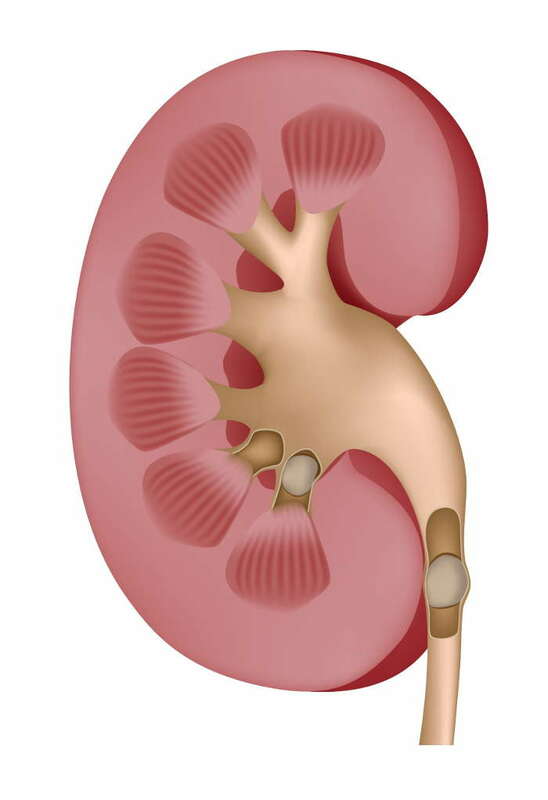 When this happens, urine backs up in the urinary tract, which causes the intense pain associated with kidney stones. Kidney stones are frequently associated with intense pain in the side or abdomen that spreads to the groin. Not every person, however, experiences discomfort. Some kidney stones are discovered during X-rays or CT scans for unrelated medical issues. Others cause undeniable symptoms such as blood in the urine, frequent or urgent urination, obstruction of one or both of the kidneys or a urinary tract infection. There are several ways to treat kidney stones, depending on the size and location of the stones as well as the seriousness of the blockage. People who have already had one stone are at greater risk of developing a second—their risk is 50 percent within five years, or 80 percent within 20 years. Left untreated, kidney stones can lead to kidney damage and other serious problems. Several treatment and preventive options exist, including shock wave therapy. Emmett M, Fenves AZ, Schwartz JC. Approach to the Patient with Kidney Disease. Brenner and Rector's The Kidney, 9th ed., 2011. Hall P. Nephrolithiasis. Cleveland Clinic: Current Clinical Medicine, 2nd ed. 2010. Taylor EN, Stampfer MJ, Curhan GC. Dietary factors and the risk of incident kidney stones in men: new insights after 14 years of follow-up. J Am Soc Nephrol. 2004; 15(12):3225-32. Thomas LD, Elinder C-G, Tiselius H-G, et al. Ascorbic Acid Supplements and Kidney Stone Incidence Among Men: A Prospective Study. JAMA Intern Med. 2013: (Online):1-2.